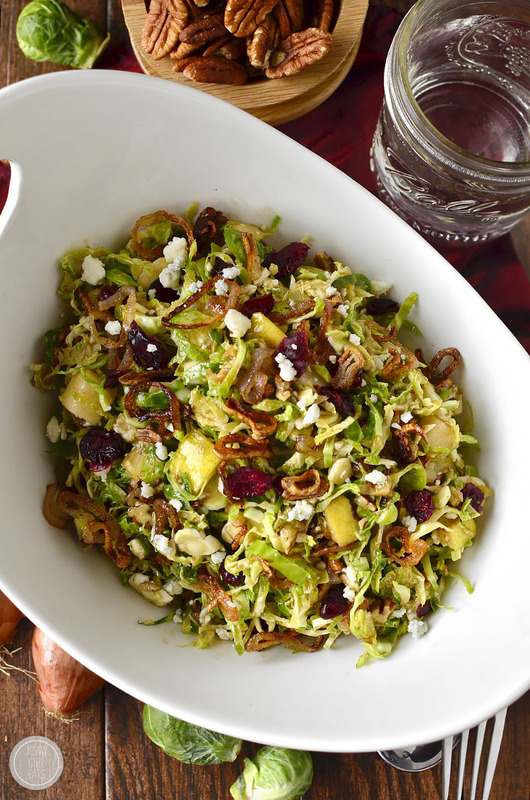 Fall Shredded Brussels Sprouts Salad is a crispy, crunchy, healthy entree salad recipe that's full of fresh fall flavors! Dovetailing tips: Prepare an additional 4 cups brussels sprouts, to use day 2 in the Sheet Pan Chicken. Using a very sharp knife, thinly shred brussels sprouts while holding onto the core end then discard cores and add shredded sprouts to a large bowl with dried cranberries, pecans, gorgonzola cheese, and chopped pears. Set aside. Heat extra virgin olive oil in a skillet over medium-high heat. Add half the shallots then fry until light golden brown, 1-2 minutes. Scoop onto a paper towel-lined plate to drain then repeat with remaining shallots. Sprinkle with salt then let cool slightly. Add ingredients for Maple Balsamic Vinaigrette together in a jar then shake to combine. Pour over salad then toss to coat. Add fried shallots then toss to combine, and then serve.